Ballet and science – my two favourite things! As well as being a full-time presenter for science made simple, I also teach ballet. In honour of World Ballet Day, I decided to merge my favourite things, and look into the science of ballet. I have loved both dancing and science for as long as I can remember. I used to tap dance around supermarkets whilst my brothers played football with a sprout. But how much science is there in ballet? It turns out – a lot! In fact, everything a dancer does is linked to science. Nutrition, physiology, psychology, forces – just to name a few. I’m going to look into a few of the key moves in ballet and discuss the science involved. All humans (not just dancers!) have a number of things working together to help us to balance: our visual system, vestibular system, and proprioception. Our eyes (visual system) play a big part. Try this: stand on one leg. Easy, right? Now close your eyes. Suddenly standing on one leg gets a lot more dificult! Our ears (vestibular system) have an organ in the inner ear that contains a fluid called endolymph. The movement of this fluid helps us to work out how our body is moving. Proprioception is the feeling of knowing where parts of our body are without looking. Try this: close your eyes and try to touch one finger to your nose. You should be able to find your nose without too much difficulty. This can be actually used to test if a person is intoxicated – alcohol impairs the ability to detect where your body is in space and should be harder to do after alcohol consumption. Ballet dancers rely on the above systems more than most of us, and have refined these sensory capabilities over years of training. During a balance, these systems work alongside each other, with the dancer making tiny adjustments to remain in balance. In my ballet lessons, dancers will be asked to hold a certain position in a balance, and then close their eyes. By working hard to maintain balance in the absence of the visual system, dancers become more aware of proprioception: where your body is by just feeling it! Dancers’ intense training allows them to develop muscle memory, and combined with their enhanced flexibility, be able to hit precise positions such as arabesque (pictured left) and hold them. We need to consider centre of mass.This is the centre point of all the mass in our bodies. When we’re standing up straight, our centre of mass is just below our belly button. Try this: Stand up straight with your back and heels touching a wall. Now try to bend over and touch your toes. Whoops! It can’t be done without you falling forward. As soon as our centre of mass moves forward, and not above our feet, we begin to lose our balance. So why can we bend to touch your toes when there isn’t a wall behind us? Without a wall in the way, as we bend forwards our hips move backwards, keeping our centre of mass above our feet. For a dancer en pointe, as long as they keep the centre of their mass above their pointed toe, they should be able to balance. A pirouette is a is a spin on one leg – which can be done en pointe (in pointe shoes) or on the ball of your foot. Sometimes dancers will do many pirouettes at once (the world record is 55!) When we spin, the fluid in our inner ear spins too, and the feeling of dizziness comes from the fluid continuing to move after our bodies have stopped spinning. So why don’t dancers get dizzy? One technique dancers use is spotting. This is usually where the eyes focus on the same object once in a rotation. When the body begins to turn, the head will remain facing forward, with the eyes focussing on a particular object. When the body turns so far that the head has to move, it whips around, the gaze fixing back on the same object. The body is moving at a fairly regular rate, with the head moving in short, sharp bursts. This can happen many times in a short period, but the eyes only focus on one thing, in one direction. As well as spotting, some research suggests that dancers can actually train themselves to stop becomming as dizzy. One study, published in the journal Cerebral Cortex, suggests that trained dancers are able to suppress the signals coming from their inner ear. It’s not advantageous for a dancer to feel dizzy when doing pirouettes, so over time signals from the vestibular system may lessen. Yes, yes it does! Professional ballet dancers will often leave an intense training session with bleeding toes. 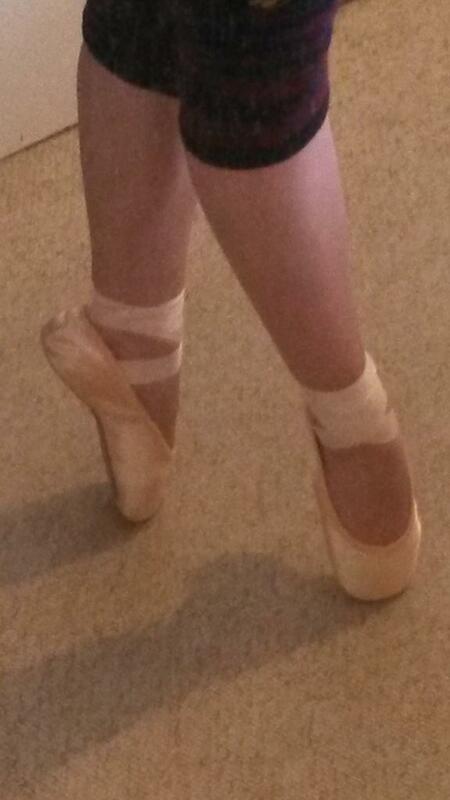 In my youth however when I’d just begun to dance en pointe, I could jump up onto pointe easily without any pain. One reason it’s not as bad as you might think (apart from the years of training!) is down to the pointe shoe. Pointe shoes are not solid blocks of wood as is commonly believed, but are intended to be supportive, slightly flexible, and move with the feet. As everyone’s feet are different, there are many different shapes and styles of pointe shoe. Just as you’d select a bowling ball that’s the right weight for yourself, pointe shoes will be fitted to the individual depending on foot shape, ability of the dancer, and the choreography of the dance. Along the bottom of the shoe, there is the ‘shank’, which is rigid and is intended to support the foot. The toes fit in the ‘box’, which has a flat bottom for balancing on. The shoe itself is typically made of layers of canvas and fabric glued together, allowing for some flexibility. Rolling through demi-pointe to pointe, showing the flexibility of the shoe. All rights reserved. What you don’t see though, is all of the toe pads, gel spacers or lambswool that dancers may use to cover their toes to lessen any pain. I’ve certainly found that my toe pads have come in handy inside a painful pair of heels! As you can see, science is integral to ballet, and indeed any form of dance! It’s been lovely to combine my big passions of science and dance in this short blog. If you have any questions about this topic, please get in touch, I’d love to help. Contact details can be found by clicking my name, above.